Economy Passenger Four-Way Lug Wrench Socket Sizes 3/4", 13/16",7/8", 17 mm Ken Tool T61 / BOWES KT T61. 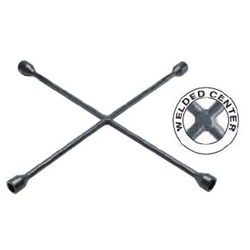 These wrenches have fully welded centers which stand up to everyday use. 3/4" SAE is also 19 mm.